SALINAS, CA (Oct. 1, 2018) – Church Brothers Farms, a leading fresh produce farming/shipping company and grower-owned processor, True Leaf Farms, will launch products and new packaging at the PMA Fresh Summit in Orlando in booth 3851 in the Salinas Valley Grower Shipper Pavilion. The company will share four new products at the show, starting with Baby Tango Greens for deli, wholesale and foodservice channels. Tango greens feature an oak shaped leaf with curled edges that give the tender green variety its signature look. The three-dimensional leaves add texture and loft to any plate application, said Kori Tuggle, vice president of marketing. The Baby Tango leaves are bite size, making the product a versatile for use in salads or as sandwich toppers. In addition, the company will offer a 1-pound bag of washed and ready to use parsley for retail customers; a 2-pound baby kale blend in a 2-pound clamshell for retail customers; and baby Romaine for retail, wholesale, foodservice customers. Church Brothers Farms will also debut packaging in Orlando, highlighting new restaurant retail cartons for Tuscan Spring Mix, Wild Arugula, Spring Mix and Baby Spinach along with new retail display ready cartons for club store customers. 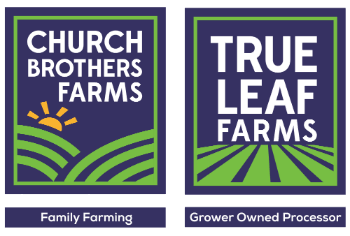 Church Brothers Farms is a vertically-integrated family owned and operated company that produces a full line of fresh vegetables year-round with an in-house farming/harvesting program and state of the art processing plant, True Leaf Farms. We are a grower-owned processor, farming the majority of our raw product ourselves; adhering to industry-leading food safety and quality standards. The Church family has a legacy of service and innovation; we deliver produce with passion.